The Long Reef Aquatic Reserve was declared primarily to protect the marine invertebrates and sub-tidal marine plants and animals. 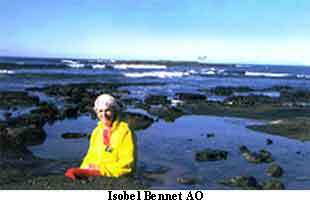 Isobel Bennett AO (1908-2007, at right) was a marine conservation pioneer whose work on Sydney’s rock platforms led to the establishment of the Aquatic Reserve in 1980 by the state government. The reserve covers an area of approx. 60ha from the high water mark out to 100m from low water, extending from the Collaroy rock pool south to Long Reef Surf Club on Long Reef beach. 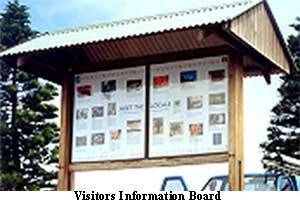 Before visiting/walking on to the reef, first read the Fisheries Information notice board (below) located above Fishermen’s beach. 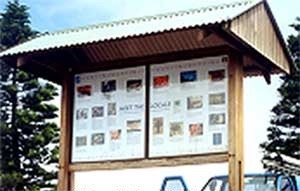 The rock platform is a valuable home for protected marine life – photos and descriptions of marine life are given on the display board. 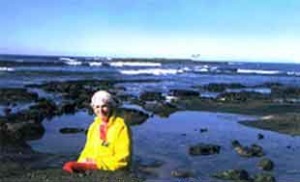 Conducted rock platform walks are scheduled by “Fishcare Volunteers“ during summer. Populations of shellfish, crabs, worms, sea squirts, and seaweeds are among the immense variety of animals and plants that live there. Bird life consists of a wide variety of shorebirds and migratory wader birds that feed on the marine invertebrates living on Long Reef rock platform. See theMigratory Shorebirds Fact sheet for details. 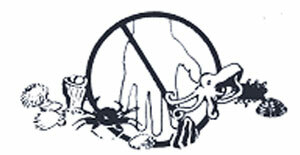 The taking, collecting, disturbing or destroying of any marine life dead or alive, other than fin fish is prohibited. Fin fish can be taken by line or spear within Fisheries size and bag limits, but you must bring your own bait. No pets are allowed on the Aquatic Reserve, beach or rock platform. If you observe illegal activities phone Fisheries on 1800 043 536.